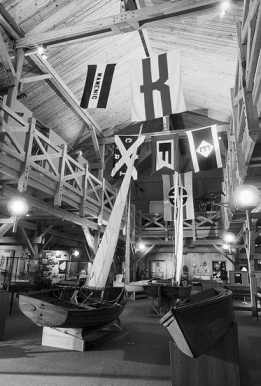 The North Carolina Maritime Museum began under the auspices of the U.S. Fish and Wildlife Service and the North Carolina Department of Conservation and Development in the 1930s. Local citizens donated valuable marine life specimens and maritime artifacts that held memories and represented the life and work of coastal natives. Roy Hampton of Conservation and Development was de facto curator of the collection in Morehead City, which was located on the site of the present-day civic center. In 1950 the collection was taken over by the North Carolina Department of Agriculture as an extension of the North Carolina Museum of Natural History. Ruth Deyo of Morehead City became manager of the collection and tended it on an unpaid, seasonal, part-time basis much as Hampton had done. In 1975 Charles McNeill was named curator of the collection by Agriculture Commissioner James A. Graham and became its first paid employee. The museum moved to a storefront location on Turner Street in Beaufort, and McNeill began the process of building a staff. The modern Maritime Museum features an eclectic collection of maritime artifacts and natural history specimens. The former include navigational instruments, boat models, boat-building tools, nautical paintings and prints, and traditional wooden boats of North Carolina origins. The museum's natural history collection includes animal and reptile mounts representative of the coastal plain and one of the largest shell collections on the East Coast. It also includes a small aquarium supplied from sea life captured locally by staff members. The museum researches and publishes works on topics pertinent to its mission of preserving the state's maritime and natural coastal history. Works on traditional boats, coastal flora, boat models, and maritime history are written by members of the museum staff, produced by the museum, and sold in the museum bookstore. Coastal folklife was added to the museum's areas of research in 1988. One of the museum's strong suits has been its high-quality, imaginative public programs, led by curators with appropriate academic backgrounds. The programs include offshore trawl and dredge trips, where participants get firsthand looks at whatever the net has captured; tours to capture sea life at nearby jetties; searches for shells on Bird Shoal and for fossils at Aurora; bird stalking on the Outer Banks; and talks with local boat builders on Harkers Island. The former U.S. Coast Guard station at Cape Lookout serves as a program facility for studying dolphin behavior and for the barrier island conservation curriculum. Since the museum opened a 20,000-square-foot facility in 1985, it has attracted about 200,000 visitors annually. Reminiscent of the old Outer Banks lifesaving stations in style, the building has a gray cypress shingle exterior; the interior is post-and-beam, all-wood construction of warm, unpainted yellow pine. 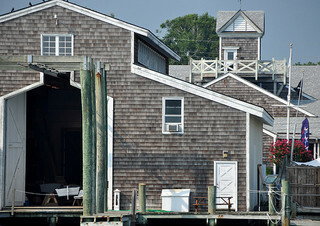 Property for the museum and its boat building center added in 1990 on the waterfront was donated by Harvey and Evelyn Smith. Back of the North Carolina Maritime Museum. Image courtesy of Flickr user Susan Smith. Available from http://www.flickr.com/photos/cellphonesusie/5935502131/ (accessed August 23, 2012). Mike Childs, Goverment and Heritage Library, State Library of North Carolina.